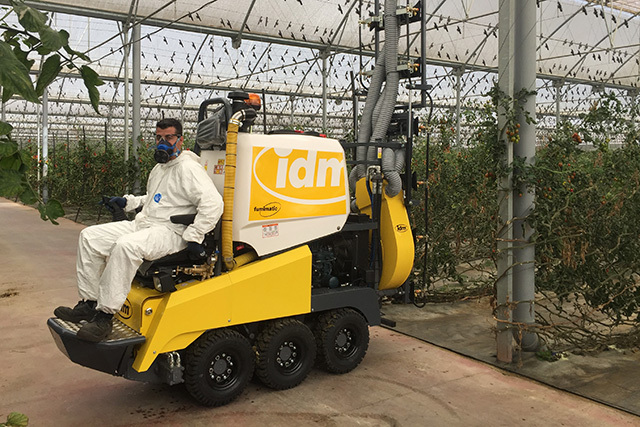 Crop protection exclusive equipment from IDM for vertical spraying in greenhouses. Specially suggested for big farms and heavy work conditions, and high density crops. The high pressure spraying pump provides an homogeneous vertical curtain. Beside the high pressure pump, it has a turbine that steers the air flow trough pipes providing and even air distribution along the plant height. The air brakes the drops making them much more smaller. It creates a misting fog with high crop penetration. It also moves the plant forcing flies and insects to get out of the leaves underside and to fly. The covering on the beam and underside of the leaves is maximum. The nozzles have a closed position and three different flows which can be selected according to the type of treatment. As the plants grow we will open the nozzles. We can apply different flows to different heights of the plant. We are able to fix the air turbine flow. If the crop rows are very narrow, it might be too strong and might damage the plants. We can fix the driving speed when spraying. Likewise, we can fix the pressure, spraying flow and air flow. 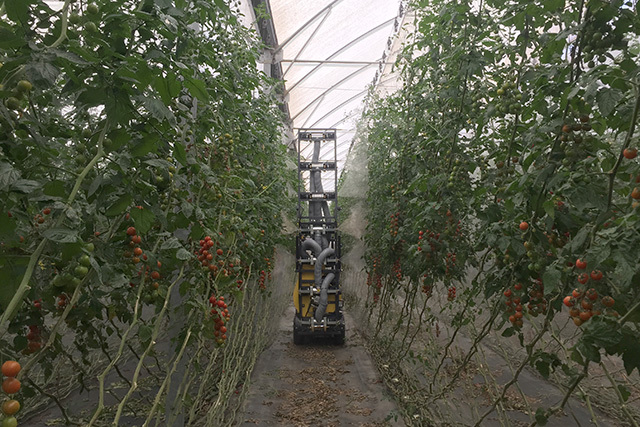 Once the parameters are fixed we will do the crop treatment always in the same conditions: same driving speed, same pressure and same spraying flow and same air flow. Thus, we guarantee that all the treatments are even and homogeneous. 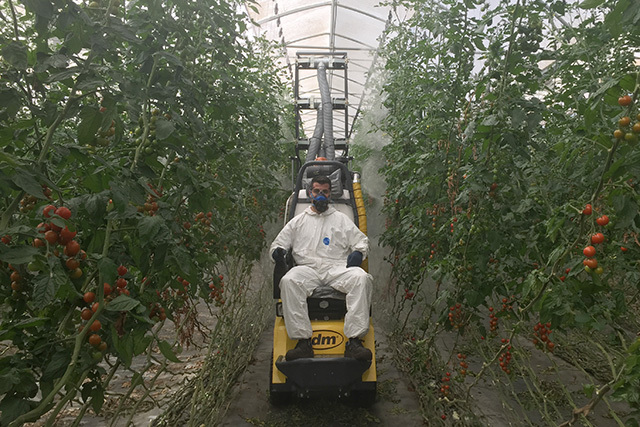 Beside having maximum spraying quality and effectiveness, we will get important mixture savings. The 6×6 exclusive IDM traction system provides total traction in any type of soil condition even with lot of sand or mud. The central wheels are placed a little bit lower so when turning by contra rotation do not drag the ground. Its steering and turning system provides an unique maneuverability. It is steered by a joystick in a very simple and intuitive way. The air pipes can be folded so the maximum height of the machine when folded is 2 m.